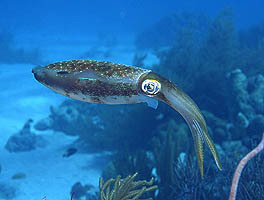 We saw several Caribbean Reef Squid while we dove near Bonaire. This Reef Squid was nearly 2 feet long. Click here to learn how this squid checked us out. There were amazing things to see when diving from the shore. 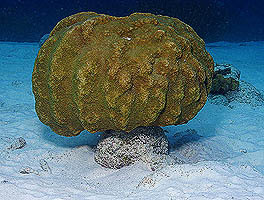 This fantastic Star Coral was big and healthy, but the surge and waves pushed sand that was eroding its base. Click here to read all about it. 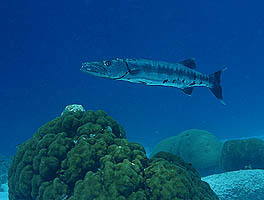 Barracudas look ferocious but are mostly harmless to divers. We saw this big beauty near the shore about 8 feet underwater. Click here to see this fish up close.